Why should we care? Because some of us love the music. Some of us even commit that chauvinist crime of saying: “He’s the greatest Jewish composer” as if there were a contest out there. (He was reviled with anti-semitism in Vienna during his lifetime, especially around his directorship of the Vienna Court Opera). But two of the most progressive conductor’s, Leonard Bernstein and Michael Tilson Thomas (both Jewish), both of whom regarded Mahler as central to their lives, are just full of the usual clichés about him. Oh, like: that those wonderful and suggestive, disintegrating endings to his final works are “about death” or about his death. Well, maybe they are, but HE never said that. 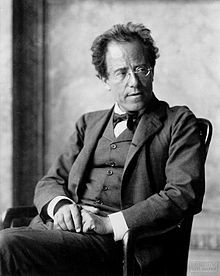 Thomas does get off one perceptive analysis: tracing the use of the musical “turn” from Mahler’s first work, “Songs of a Wayfarer” to the final movements of his last two completed works. And the importance of the tone, A, in that early work and then in the climax of the first movement of his 10th Symphony. A final shot of Thomas at Mahler’s grave in Grinzing, a suburb of Vienna, shows without comment, stones placed in the traditional Jewish manner on top of the Mahler’s gravestone. His remains were not allowed to be buried in the same cemetery as Beethoven and Schubert. “Those who love me will find me” he said.